"A stately procession circled the great hall, presenting themselves to the lords of the castle. We were transfixed by the dancers, and by the grim truth shared by all of them. Everyone in the hall was dead! They had sword wounds and axe cuts and burns. At the high table, the king had the blackened face of a poisoned man. 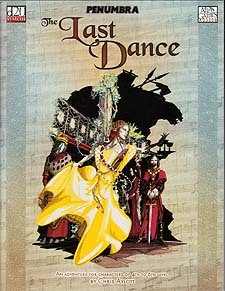 Even in their deaths, they were beautiful - even in their deaths, they danced. ... And a strange compulsion rose from the floor into our feet, and we stepped down into the hall, and we joined the pavane and danced toward the king." A millenium ago, the kingdom of Dayvos fell in a single night to an act of magical treachery. Tonight, the echoes of that powerful spell have drawn you into its last hours. If you are quick-witted and light-footed, you can free the souls of the imprisoned dancers or even change history. If you fail, you will dance among the dead forever! * An unearthly journey into a time-forgotten woods warped by magic, where the only escape is in uncovering the dark consipracy of an age past. * New magic items like the Torc of missile deflection, and a new minor artifact called the moonstone that amplifies the effects of arcane spells. * The manavore, a dangerous new monster that sustains itself by absorbing magic, and might become your arcane spellcaster's worst nightmare!